boygenius boygenius: Interviews, features and/or performances archived at NPR Music. 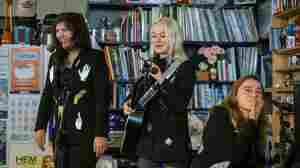 November 16, 2018  Julien Baker, Lucy Dacus and Phoebe Bridgers are all Tiny Desk alumae, but here they play together at NPR for the first time as boygenius, one of this year's best surprises. August 21, 2018  The three songwriters share a musical sensibility and a friendship, so it's only natural they combined their superpowers for a collection of aching, intimate songs.